It’s not all challenges, this parenting thing. In fact, it’s mostly good. Amidst the struggles and doubts that inevitably come up (see Where’s She Getting That From? and Keeping My Eyes Open), there are many moments of sweetness. Like when my daughter surprised me and changed the ring tone on my cell phone to be a recording of her own voice. Now every time my phone rings, I hear her saying, “I love you, Mommy. I love you. You’re the best mommy in the whole world. And I miss you right now. 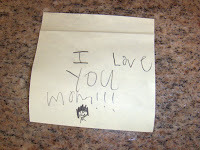 I love you, Mommy…” I can’t tell you how many times that ring tone has stopped me in my tracks and made me smile. Even choked me up. “You can choose because it’s your birthday tomorrow,” my son told my daughter. “I kind of want to watch a TV show and not a movie, but I don’t want to hurt your feelings,” she said back to him. And what about the time when I came home from being gone for a few hours and found two vases of flowers–flowers my kids had picked for me–on the table? Moments like these–moments of magic that weave their way into this journey called parenting–make all the challenges along the way more than worth it. « Where is She Getting That From? Thanks for stopping by my crafty blog. I am so glad that you did because I am just loving yours! Motherhood is funny isn’t it? With all of the hard days, all it takes is a little magic and the bad stuff just disappears. Thanks for the reminder…this really is the best job around!